Signal is dramatic and powerful, and limitless in rhythmic potential. Excellent presets. Effective interface. Lots of rhythmic options. Could do with a manual. 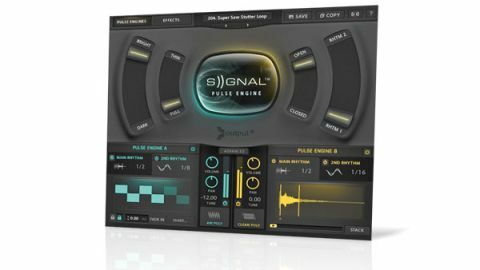 Signal is a 40GB (compressed to 20GB) 'pulse engine' library for Kontakt, drawing on a range of multisampled analogue synths and acoustic and electric instruments. "A good range of per-pulse and global effects are onboard, and a macro system enables custom performance setups to be built"
Two sound sources ('pulses') are combined in a patch, each controlled by two modulators and playback controllers, chosen from four available types: Wave (LFO-modulated), Step (step sequenced), Arp (arpeggiated) and Loop (Signal's own 'tape looping' engine). These can be applied in parallel to a range of parameters (volume, pan, filter, etc), except for Loop and Arp, which only handle playback. A good range of per-pulse and global effects are onboard, and a macro system enables custom performance setups to be built. The 500 tagged presets don't disappoint, and the interface is effective and handsome. On the downside, it lacks a manual (the onboard help doesn't cover it) and the whole 'pulse' marketing makes it sound more high-concept than it actually is. Minor complaints, though.